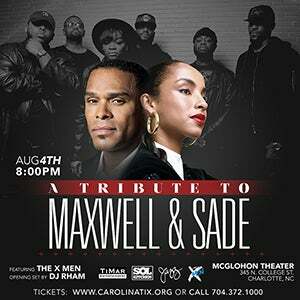 Maxwell and Sade are two of Soul & RnB music’s most celebrated voices. Maxwell, born Gerald Maxwell Rivera, hails from Brooklyn, NY & has been credited with helping to shape what has been termed the "neo soul" movement that rose to prominence during the late 1990s. About the XMEN: The XMen is a songwriting/production group turned performance group from right here in Charlotte, NC. Comprised of members Evan Brice, CJ Mercer, Chris Kee, CJ Thompson, Brandon Sutton and Ahji Love, The XMen's members have toured the world with artists ranging from Pastor John P. Kee, to Usher. Since joining forces, The XMen have produced tracks for Leela James, produced & programmed live shows for K. Michelle and headlined the Soul Junction festival with Grammy Award winning jazz bassist, Derrick Hodge. The XMen are a well-oiled, highly trained and well-rounded machine that has proven to be a lethal combination in multiple settings across the board. And they're still just getting started.